Have you ever spent the time to look closely at horse poop? Yeah, me either. It would be best to steer clear of those beautiful pieces of nature, not just because of its smell – but also because there are colonies of creatures that shoot projectiles all over the place. Yes, you guessed it. I’m talking about pilobolus. 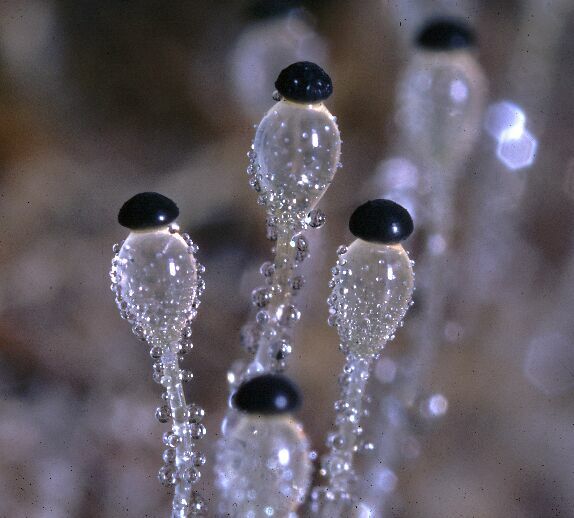 Pilobolus is a genus of fungi that grows on herbivore feces and performs incredible feats of aerial acceleration. When these fungi mature, they grow bulbs that just keep building liquid pressure until they burst. This burst of explosive pressure is directed to a black spore at the tip of the fungi and accelerate it from 0-20kph (12.4mph) in 2 millionths of a second. That means they pull 20,000G of force. This is equivalent to a human being launched at 100 times the speed of sound. That’s 76,121 mph at sea level. Incredible. After marveling at what these amazing spores are capable of, you just have to wonder – why? This answer actually has to do with the physics of the size of the projectile in aerial environments, but we’ll start off with the basics. In order for these fungi to reproduce they first have to be eaten by a herbivore, but they have one problem – they grow on poop. A healthy herbivore will not eat its own poop, so the fungi had the genius idea of just shooting its spores onto the grass. The only problem is that these spores are so small that the aerodynamic forces become exponentially intensified. It would be like flicking a coin through honey. The smaller and lighter something is, the easier it is for aerodynamic forces to counterbalance that force. Try throwing a ping pong ball as hard as you can; then try throwing a baseball. They are both the same shape, but obviously the ping pong will fall short because of counteracting aerodynamic forces. So basically, since the spores are so incredibly small and light, they need that explosive force in order to propel themselves away from the feces that they grew on. Fascinatingly enough, even with 20,000G of force, the spores only land around 2 meters away from where it was shot. It’s amazing how the fungi evolved to develop such a mind blowing adaptation. “they have one problem – they grow on poop.” ROFL!! It really cracked me up; very clever post! I’m sure your post will be the only one tagged “poop”. Haha this is a funny discovery. I wonder who even thought of examining bacteria from horse “poop”. Imagine if we can make a system that can replicate that speed! !